Using natural products for our range of Herbal Steam saunas and Massages. We work from our heart to provide a professional service aimed at producing relaxation and health benefits. Experience a massage or a steam sauna. Or combine both. Enjoy a free nutritious snack and tea. 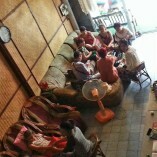 Relax in our shop or enjoy the rooftop chill out area. Sawadee ka. Herbal Compress massages. Steam Saunas. Oil massages. Thai traditional massage. Beauty treatments. Manicure and pedicure. Free tea and snack.